Sardines from Kujukuri and Choshi, Japan. So soft that you can eat them even when they’ve cooled down. 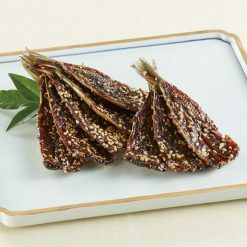 The sardines used in this product were caught and harvested from the Kujukuri bay, then dried in the traditional style of mirin-drying. Mirin-drying entails soaking the sardines in mirin and other sauces, then letting them dry out. These sardines will not harden, even after becoming cold. This makes the sardines ideal for packaging in lunch boxes or preparing for later consumption. Due to our customers’ requests and our pursuit of meeting their demands, we have reduced the amount of sugar used in our products. This product has been updated to include 25% less sugar than previous packages. Sardines are a great source of selenium and vitamin B12. They also contain plentiful phosphorus, protein, omega-3 fatty acids, and vitamin D. They are also a good source of calcium, niacin, copper, vitamin B2 and choline. Kujūkuri is a town located in Chiba Prefecture, Japan. Commercial fishing and food processing, in particular to sardine processing, is a primary industry in Kujukuri. One common tourist destination, is the Kujukuri Sardine Museum. Choshi’s Tokawa Fishing Port is also renowned for its fishing galore. It is one of the most notable fishing sites in Japan and remains a vibrant figure within Japan’s culinary map. Remove the amount of sardines you’d like from the bag and thaw in the refrigerator. To cook, neatly arrange the sardines so that they are not touching one anotheri in a well-warmed grill or frying pan.Reduce the heat to low heat, and be sure as to not burn your sardines.Serving suggestions include having the sardines as a side to your rice, or packed inside a rice ball. The mirin-dried sardine continues to be a popular Japanese staple, beloved by both old and young people. 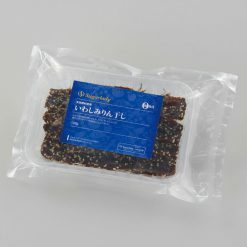 This product contains sardines (Chiba prefecture), soy sauce, mirin rice vinegar, sugar, white sesame seeds, (this product contains wheat) . Origin of ingredients: sardines (domestic; Chiba prefecture). Prepared and packaged in Japan.